What is behind the hat obsession. My Obsession with Hats Continues. I know I can knit faster. 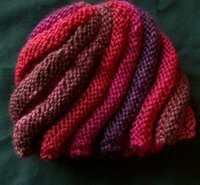 I could just knock out some hats plain knitting and make 6 virtually identical hats in no time at all. I suspect the Marines who receive them wouldn’t care. But what is the fun in that? I am not simple knitting for them. I am knitting for my pleasure, too! Hat 3 got started and frogged 3 times.--I never really got past row 6 or 8 or so. Eventually I changed yarns, change process (went from brim up to a top down method) and changed designs. 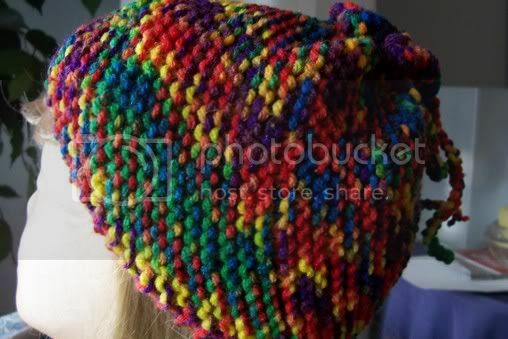 I am/am not going to give you the pattern for this hat. It follows a sort of cellular automaton design. it evolves into K3 of CC, K1 of MC. At some point it flips, (K3 of MC, K1 of CC), and them flips/flops back and forth before the hem. The 3:1 pattern start over every new “segment” or 6 times per round. These segments (quite visible in top), continue all the way to the hem. The starting point for the basic pattern is different in every round. Sometimes, pattern reverses at the mid point of the segment. I haven’t thought about it enough to figure out the ‘rules’ that govern the pattern. My fingers know the pattern better than my head. At the beginning of each round, I find my place, and then just knit. I find this sort of generic fair isle to be almost mindless. The hat was knit with Paton’s SWS and Paton’s Classic Merino, on size (US) size 8 needles. The SWS (soy/wool/stripe) provided the color changes. Cast on 6, join into round. Increase 12 stitches evenly placed, every 3rd round. At round 6, add second color (fair isle style) using a Make 1 for the new color. Continue to work in cellular automaton design (which will change, as the number of stitches increase) until you have enough stitches. In my case that was 84 stitches, (14 stitches in each of 6 segments) - you may require fewer/more if you use different yarns/needles/gauge. 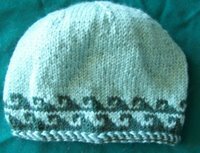 The design (fair isle) pattern will change if you have few or more stitches, but it will still work! Switch design by switching Main Color for Contrasting Color at some point. End with Ribbing or several rows of Latvian braiding. or see Unexpected Knitting (Debbie New) or Knitting Nature (Sarah Gaughan). As the year draws to a close, I am thinking about what I will be doing next year. Teaching more, (so far just at Village Knitter, but maybe even more there, and hopefully else where) is one of my goals. Maybe a shawl for her too. Sweater (maybe actually a vest?) for Grandson. I have made him a few hats, but a sweater would be nice. Finishing up DOCUMENTING Viking hat. Well, it’s good it fits him--even if months later than anticipated. And its very good it fits him now when the weather is cooler, and sweaters are more useful. 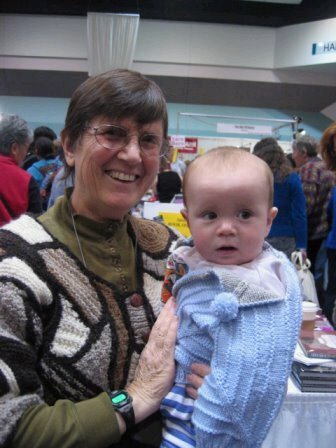 Here’s Cyrus (before he fit in the sweater) with Debbie New, (mom is behind the camera!) at Stitches West last year. Sonya (DIL) met Debbie New the previous year, when she took a class with her. And Debbie was kind enough to pose with Cyrus, because he’s wearing a sweater inspired by her design in Unexpected Knitting. So there are just 2 degree’s of separation between me and Debbie New. The sweater was one of the most fun things I have ever knitted. It was in some aspects, incredible simple. It was in other aspects, incredible complex. I suppose it was only complex if you thought about it. I suppose if you followed Debbie’s directions exactly (and ended up with an exact replica of the sweater she designed), it would have been simple enough. But I never do that! Besides, I wanted to understand the process. The sweater is made up of 2 identical hexagon sort of shapes, that are knit in the round. The shapes are folded, seamed, and simple finished. Like any sweater, GAUGE is paramount. Normally a hexagon is made from 6 triangles , each of which has equal sides and equal angles. And since the sum total of degrees in a triangle always equals 180° , an equilateral triangle always has 3 60° angles. The 6 triangles can be arranged to fit inside of a circle (6 X 60° =360° ) --a very convenient thing if you are knitting in the round. Now think what happens when you have 6 Right (90° ) angles meeting at one point. If you think it can’t be done, think again. It can. Its just isn’t a flat figure. It ripples. It ruffles. Its too big to lie flat. 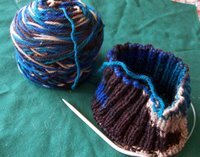 But if you fold the knitting in half, ( 540° /2=270° ) you end up with a double sided 270° shape, and that you can visualize--270° =¾ of square. It’s a letter L or Number 7 sort of shape. Put 2 together, and you can get a double sided T shape. And a T shape works fine for a sweater. I wrote extensively on the experience last year as I was knitting it. I didn’t have a blog then, but posted on Knitty’s coffee shop (BB) and on Knitter’s Review BB. (links to these sites in side column). I’ll share more about the experience here, in the next few days. Tsock Tsarina --(and is the designer of the Kitri socks the Yarn Harlots has featured on her blog, ( here and else where on her blog) gave me the most beautiful hank of sock yarn, to lure me back into sock knitting. It’s a special dye lot from Jennifer of (Van CalCar Acres) and it’s a good thing I have hats (simple hats) to knit, so my mind is free to think about what to do with this beautiful yarn. I definitely need to find a special pattern for this yarn. It’s the golden rosy dawn --ribbons of sun light -- warm and sunny, as pretty as a brand new day! So, how does that translate into a pair of socks? I’ll have to figure out a way! 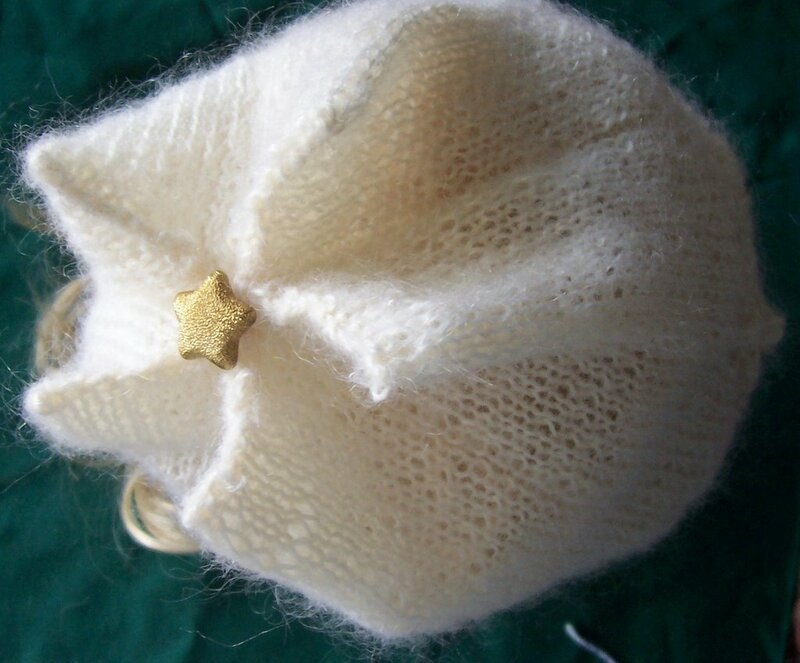 Just before I got Renee’s email, I had finished a second (improved) version of my Evening Star hat. This version done in Phildar Rubis Kid, (70% kid mohair/30% acrylic) was knit on finer needles, (with a finer gauge yarn) but still blocked to the same size as the 90% acrylic LB yarn. The improvement was simple knitting it in a better yarn! I’ve also knit second version of the Pleated Kitty--this one is oversized, and will be felted--and then photographed . 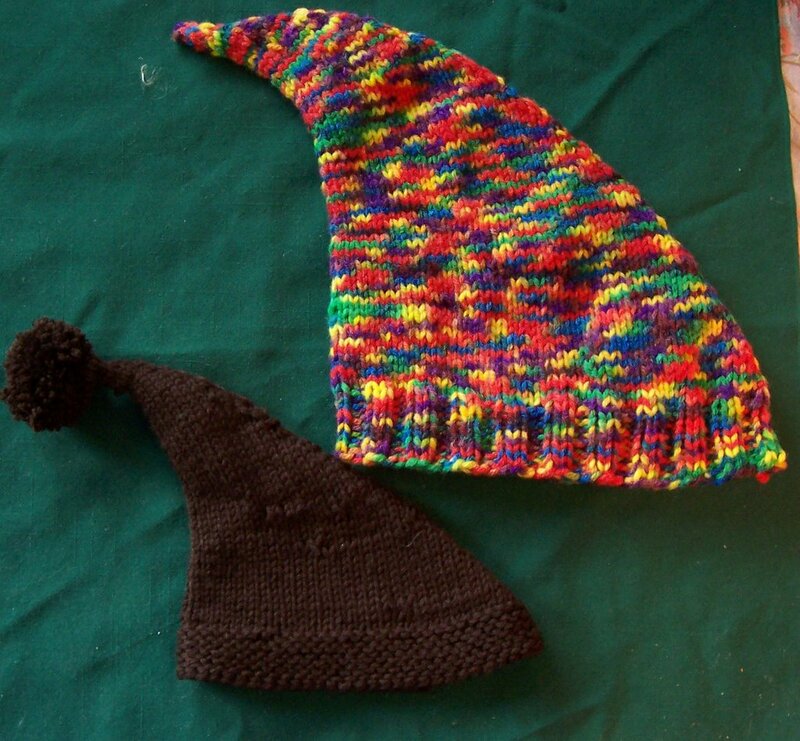 Meanwhile, last night, I completed hat 2 of my goal of 6 for The Ships Project. This hat is a simple 2 X 2 rib, made with Paton's Classic Merino, in the color Retro. I think it looks like Sand and Sea, Day and Night. Its about 12 inches long, so there is plenty to fold back to make a nice deep cuff. It’s amazing isn’t it, how enablers enter your life? 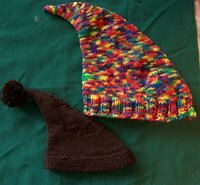 My obsession with knitting hats started up in the weeks before Thanksgiving, and was, with the sun’s light, waning. Then, along comes Renee G., and now I am, once again, working hard, knitting hats. Mind you, I am not working as hard as KnitNerd, (aka Barbara V.) who has taken a leaf out of the Yarn Harlots book, and set a goal for herself , (back in the beginning of December) of making a hat a day. And she has stuck to it.. Though sometimes she substitutes fingerless gloves for a hat. The Ship’s Project, a group that is dedicated to sending hand knit hats US service men and women. I got the link Thursday, and completed the first hat (Oversea’s) Saturday. Now I am several inches into the second. I have some very mixed feelings about a lot of charity knitting, but none at all about supporting the fine men and women who serve this country. What ever political sentiment there is state’s sides, they deserve to know their willingness to serve is appreciated. And if a hat helps, well then, a hat, or two, or dozen, it is! 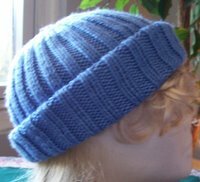 I could I suppose just knit plain hats, but what’s the fun in that? I have so many odd balls, and half balls, and bits and pieces, I’ll have some fun. Nothing too complicated, but nothing to boring either. 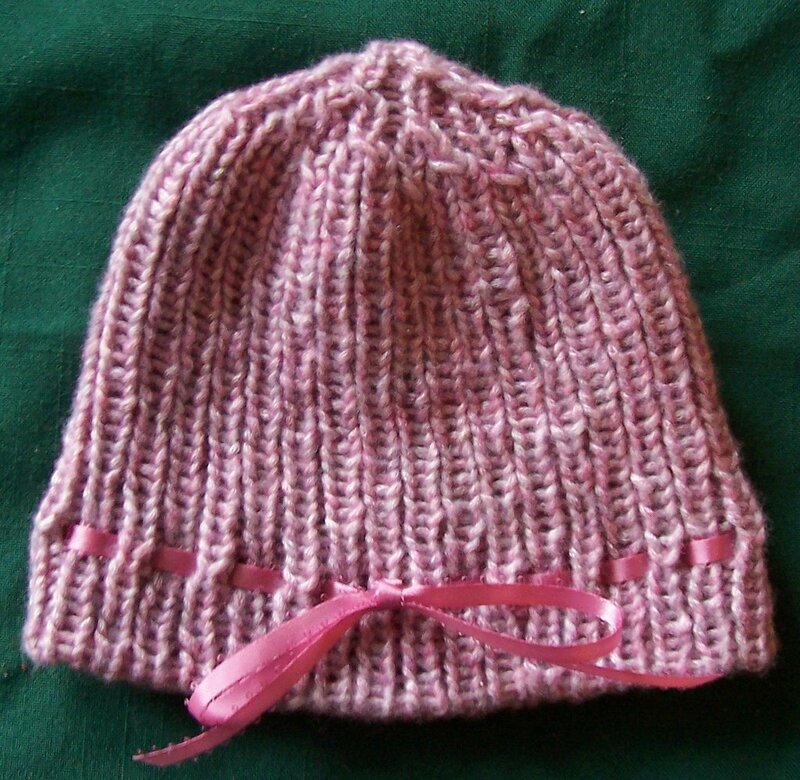 Why not check your knitting bag or basket, and see what yarn you have left froom your holiday projects, and make a hat? She’s have these by the gross! 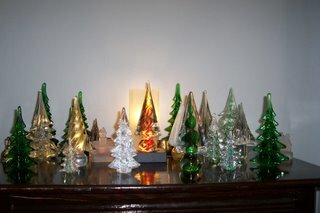 They nicely compliment my glass arboretum. I don't have a standard real or fake christmas tree. I have my glass ones, and a rope light one on my terrace (that is quite visible from living room). as your DRUG of choice? Lot’s of obsessed, I mean, Passionate knitters do. Needles, of course are the thing you need. Lot’s of cheap, readily available needles. My favorite are made from bamboo chop sticks. In most craft stores you can find wooden doll head, (these come in 1 inch and ¾ inch, I prefer the smaller ¾ inch ones) 4 in a pack, normal $1, but when they go on sale I stock up and buy a few packs.--I suppose if I looked harder, I could find the doll heads packaged in sets larger than 4 at time (and these would likely be cheaper still!) But the 4 packs go on sale often enough, so I haven't made the effort to look! The Bamboo chopsticks are almost precisely a (US) size 8/5mm. 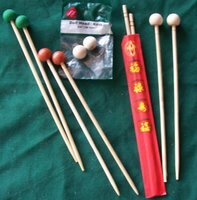 The doll heads fit the chop sticks perfectly, and unlike BEADS, they have a neat smooth round top. I twist them on, and don't need to use glue. The points of the chopsticks need some shaping, but an emery board will be sufficient to shape the dull tips into rounded (or not so rounded) points. Wax paper, (or paraffin, or even some softened bee’s wax) polishes the bamboo to silken smoothness. A final touch is to paint the dolls head knob, and carefully add a number 8 or 5mm measure to the knob end of the needle shaft. I just mask the needle and spray paint them, but you could put an effort into hand painting the tops if you wanted. Worst case, the set of needle cost $0.59, often a set cost a mere 25¢ --making them cheap enough to give away freely! And every knitter has some small balls of yarn, to give away with the needles. Perhaps you’ve thought about teaching knitting at your child school, or starting a knitting club as an after school project. These needles are perfect low cost way to get started. Just hand them a set of needles and yarn, and invite them to learn to knit for themselves! What can I say? More hats! 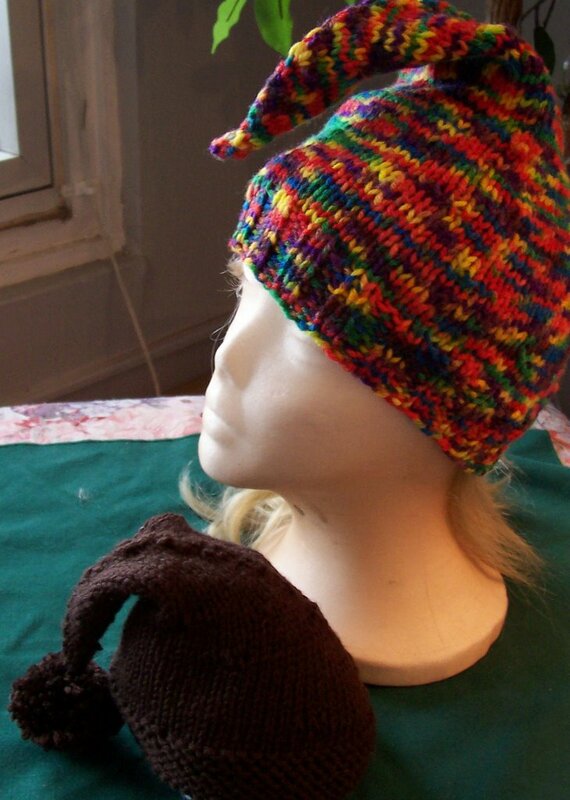 Followed by Whimsy--an adult hat. Not the most conventional hats, but every once in a while, its fun to have wild and crazy hat. And Whimsy, for certain is a wild and crazy hat! 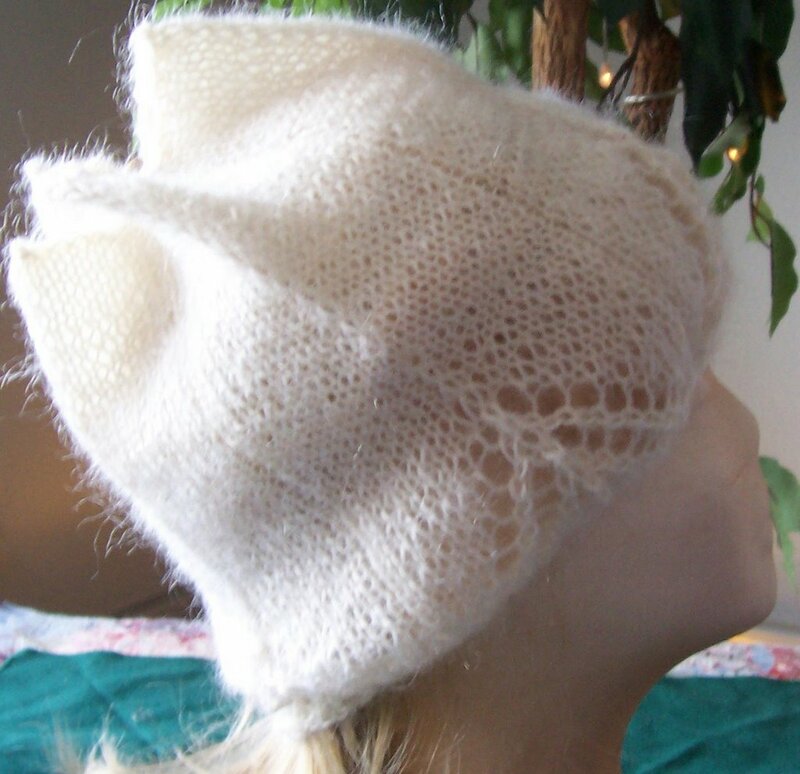 Whimsy was a refinement of Elfin, and made with the yarn every one loves to hate, (Red Heart!) --and used up every inch (but 15!) of an incomplete skein. I'll have to rumage through my stash and find something as riotous in color for a 'final version' . Elfin was the First Draft (I alway make first drafts in miniture) Whimsy 99% the same, is a refinement of the design. The difference can only been seen on very close examination. 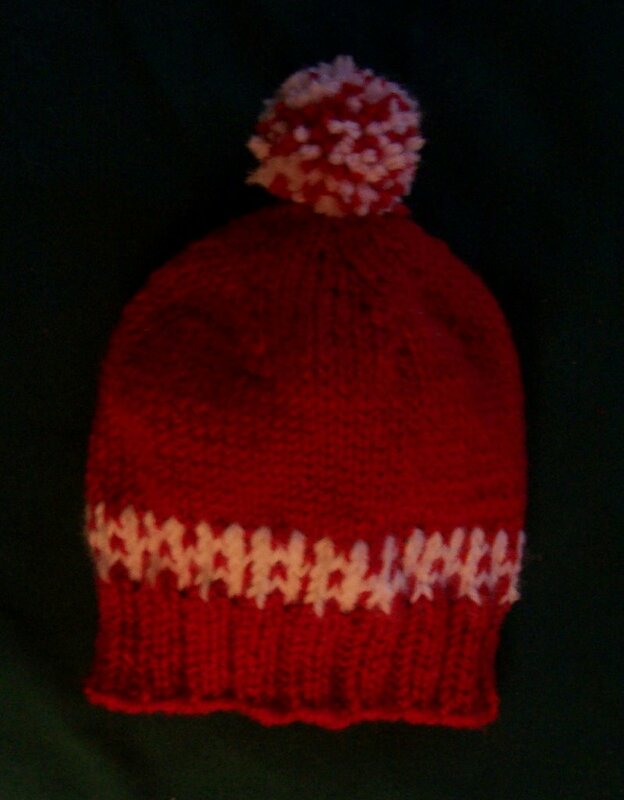 I actually have half a skein of OLD (i.e., 100%wool) Red Heart, in a very similar colorway, but I am sure its not enough yarnage for an adult hat. Whimsy is likely to find a jingle bell attached at the tip, --perhaps a jingle bell nestled in a white pom pom, to mute the noise--but it does need something to finish it. Elfin finished up the Mode Dea yarn I used for, Kevin Z's hat (no photo as of yet), and for the In the Pines Headband. (previous post)--It is intended for Kevin and Jill's soon to be born son. Meanwhile, I have a pair of socks on needles now for the better part of a month, but as soon as I finish one hat, I compulsively start another. There is some knitting on my needles right now, that was supposed to be a scarf, but it keeps whispering to me, MAKE ME A HAT! I am trying my hardest. If I do stick to my guns and make a scarf, you can be sure that there will be a hat to follow! Obviously, the scarf is not a conventional scarf, nor will the hat be a conventional hat! Not yet blocked or photographed, is a remake of my Evening Star hat... with some subtle improvements--lest you think that I've only knit 2 hat in the past week! On Friday, coming home from a friend’s, I stopped into a big box craft store. (Living in a population dense area, there are several, (from several chains!) big box crafts stores with in local driving distance) --Mostly, I stopped because I wanted to use the facilities! But once there, I walk around, to see what was new, or interesting. Nothing new or interesting caught my eye. But something old did. 3 skeins of ARAUCANIA’s Quellon. Marked down more than 75%! 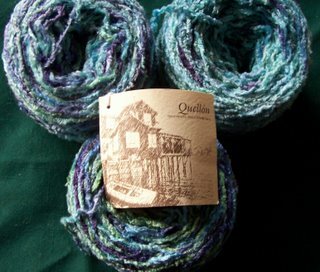 ...........--3 skeins for less than the price of a single skein! The skeins looked a bit shopworn. But the colors were lovely. But…see for yourself! 3 neat "cakes" of chenille! If I take my time into consideration, they were very expensive skeins. But since I currently have more time than money, time is a currency I am willing to spend! And spend it, I did! I spent hours! Over 1 hour per skein, untangle the yarn and winding them up. There were worms in the hank, there were wormy tangles that knotted and twisted and defined me as I attempted to wind them into hanks, even after, in theory, all the tangles had been removed! Still I am glad that I bought them.. I am still not sure what I am going to make from them-- 450 yards or so offers some options, but a limited number. In the failing light of the late afternoon, I took a photo of yet another HAT. The Charity Knitting Holiday hat, that I didn't have a photo of for the previous post. Apx. 50 yards Coffee brown. Cast on, using your favorite provisional cast on, and Moss green yarn: 116 stitches. Join into round, being careful not to twist. Drop moss green yarn, but do not cut. Pick up white and coffee colored yarns. 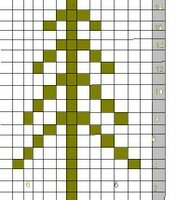 Work pattern (from Chart) there are 9 repeats of tree pattern. NOTE 1: the number 6 on chart, in lower row, indicates 6 white stitches/ total chart is 13 stitches. NOTE 2: there are long floats. You can leave them be. Or you can twist the yarns together every 3 to 4 stitches to secure them. NOTE: There are a total of 20 rounds (plain round, 18 rounds from chart, plain round) for Tree element. Drop, but do not cut Moss green yarn. *K2 with Brown, K2 with white. Repeat from * for round. 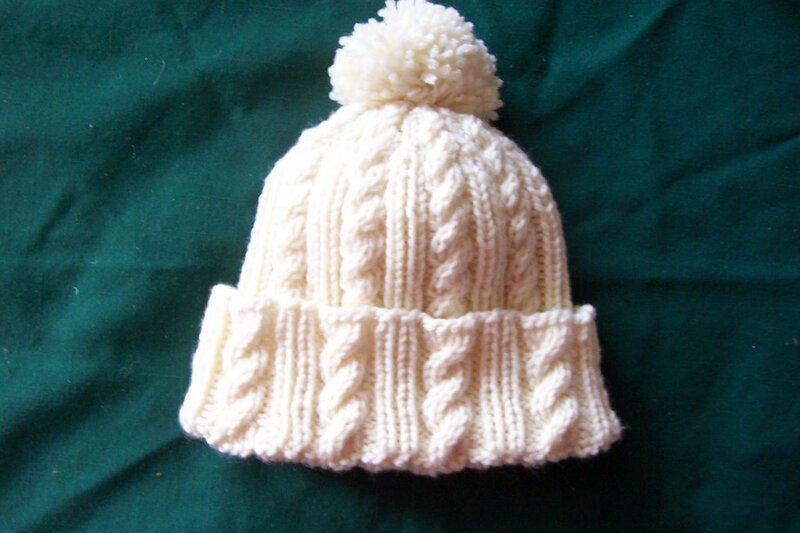 *K2 with White yarn, K2 with Coffee Brown yarn. Repeat from * for round. Cut both white and brown yarns. Before grafting, weave in all tails of yarns. Cut a tail at least 2 yards long. undoing provisional cast on as you work. 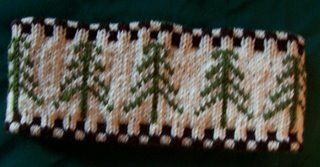 Finish by working 2 rows of backstitch outlining INNER (closer to Tree pattern) brown stitches, on both top and lower edge of head band. Be sure to backstich loosely! 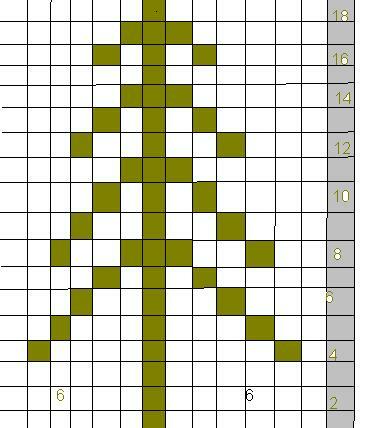 This tree pattern (chart) is adapted from Nicky Epstein's Knitting on the Edge the pattern/chart has been modified. In 2003, a good friend, Tony C died. 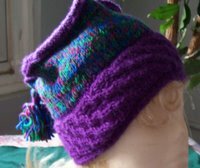 For the next year, I was obsessed with knitting hat. In 2004 I finally realized, TC LOVED to wear hats --he was famous for his hats. He wore fedora's, and caps, and stetsons and berets. I don't think he ever met a hat he didn't like. My obsession with hats was my way of mourning him. In the years since, I realize, every year as the anniversary of his death approaches, I again become obsessed with hats. I have a few more to show you. 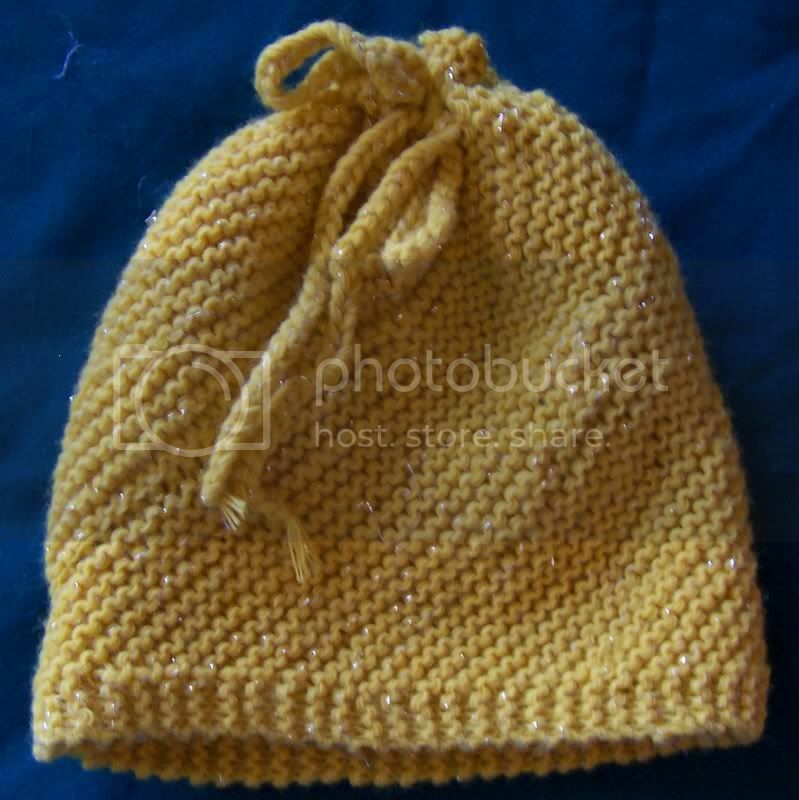 First, a Baby hat in Lion Brand Jaime, a simple thing. This is a charity hat (Saturday, my guild has a one of its two annual charity knit ins) and I'll bring this hat (and others) to the meeting. Not seen is the simple striped watch cap that I gave to Kevin Z.
I forgot to take a photo of it before I gave it to him, --but I did take a photo with his camera, and will post a photo one day soon. Its a pretty basic watch cap, with a few stripes, and neat decrease in the crown. The Tree (spruce? hemlock?) 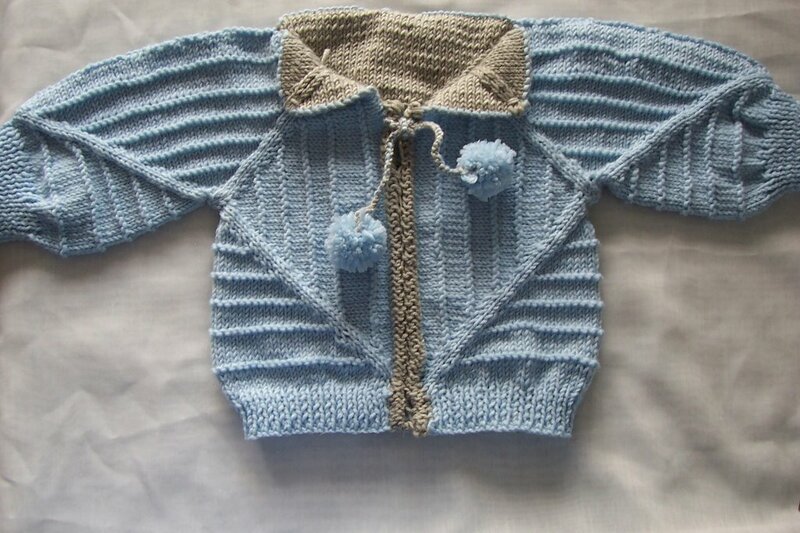 pattern is adapted a design in Nicky Epsteins Knitting on the Edge. 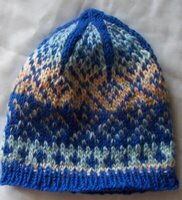 Later this week, I’ll post directions on how to knit the Fair Isle (Scandinavian) headband. And sometimes, my bluntness comes across as hostile--it less likely to happen when I speak, but in written communications, with out the tone of voice, I know Iomes off as hard. Take the stocking knit stitch. ........but stocking knit will still roll. .....It is the nature of stocking knit stitch to roll. This is not a bad thing, it just is. If you accept its nature, you’ll be a lot happier in your knitting. If you accept its nature, you can learn to use it. 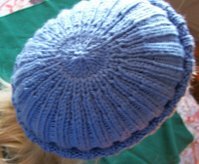 The newest entry in my obsessive hat collection (you should know, I almost never wear hats, I just design and knit them!) is my stocking knit/reverse stocking knit hat. The hat is pretty simple, I just let stocking knits nature (to roll) do most of work! The rolls make deep ridges and valleys, and they make most the design. On my way home from my Friday knitting group, I stop into Michael’s, (I had 50% coupons) and I was entranced by Paton’s SWS (soy wool stripes). I started the hat Friday evening. I finished the hat last night. (My socks (below) temporarily put aside) Self striping yarn is always fun to knit with, and this yarn is no exception. It is a gently spun single ply yarn, that felts even though it has 30% soysilk in the blend. The soy silk gives the yarn a softer, crisper hand, and a sily sheen. The stripes are good long runs -- at 35 stitches to the row, stripes lasted about 6 rows on average. 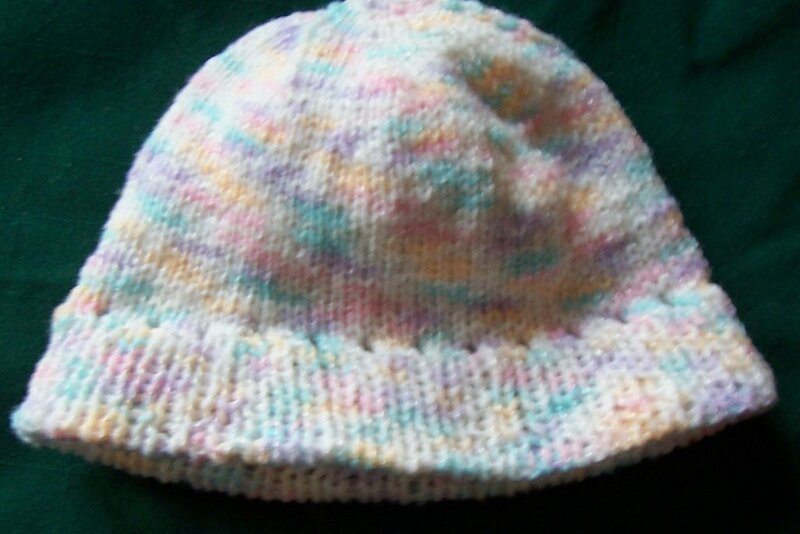 I was so pleased with how it worked up, that Saturday, when out on other errands, I forced myself to buy some more--I have been looking for something special for baby’s hat, and now I have it. and another view of the hat folded so it sort of looks like a beret (or frisbie). This hat took 2 balls (1 full ball yielded about 11 ridges/valley’s, the full hat is 13 ridges valleys..) so I still have most of the second skein left over. I think another few balls are in order, so a matching scarf or perhaps wristlets/fingerless gloves can be made. This is not quite a pattern, but an general, generic directions to make a hat of a similar style. This hat is knit flat and sewn into shape. 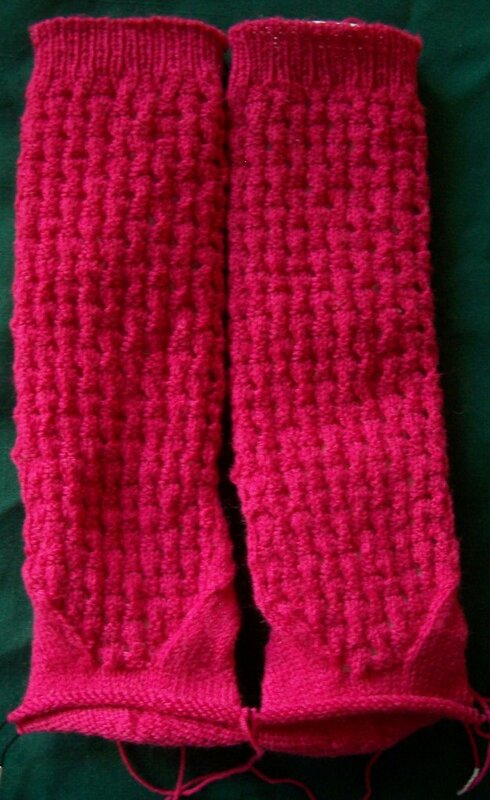 Work in Garter OR rows of Stocking knit/reverse stocking knit (4 to 6 rows) --scarf like. AT THE SAME TIME, Increase 1 at one edge (cast on tail edge) and Decrease 1 at the other edge, EVERY OTHER ROW. USE AN OPEN (yo) increase, and place it 1 stitch away from edge. This will result in a diagonal scarf, about 7 to 9 inches wide, and 20 or inches long. And here are the newest socks on needle. 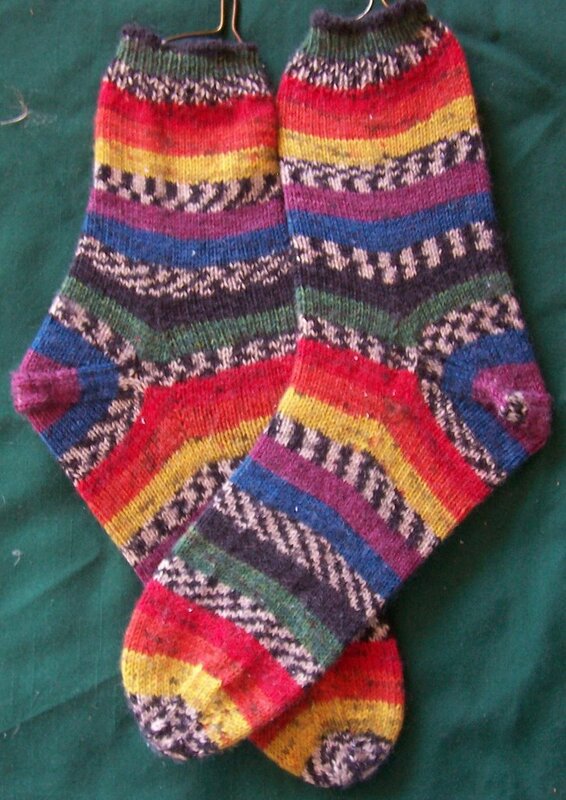 They are a rehash of the last sock --only all the issues have been resolved. 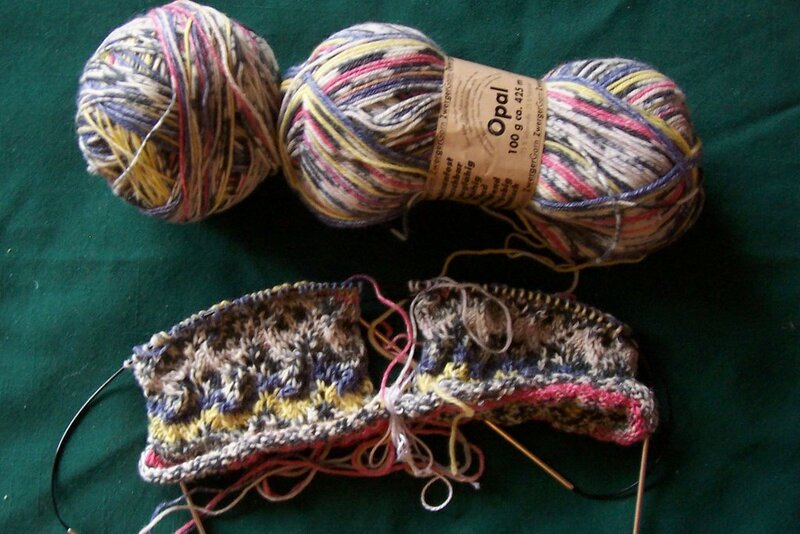 A different sock yarn (this is Koigu) add interest, but doesn’t fight the lace pattern. A different cast on (this is channel Island cast on) adds a picot edge, with less effort than *the hemmed picot edge attempted last time. Worked in the same lace pattern as before--but now, after a half dozen repeats, I have learned the pattern. A much more successful set of socks is emerging. *I have decided that I only like picot edges (the kind that are hemmed) when I end with them. 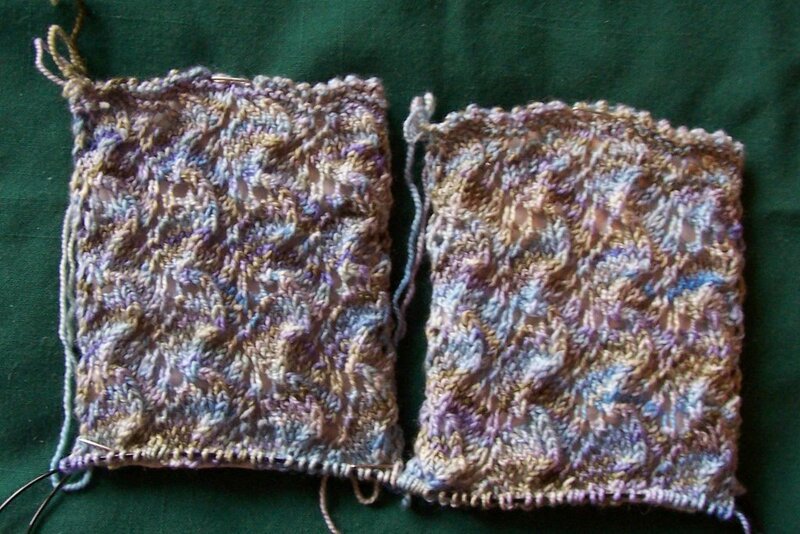 They are fine for bind off edges, but not for cast on edges. (and another hat (from some time last week..) that i forgot about. I sometimes tink, but I don’t even do that often. I tend to stop and check my work row by row, and catch mistakes before they have time to establish themselves. But these socks are the exception. .....1--The lace pattern is lost in the stripe. 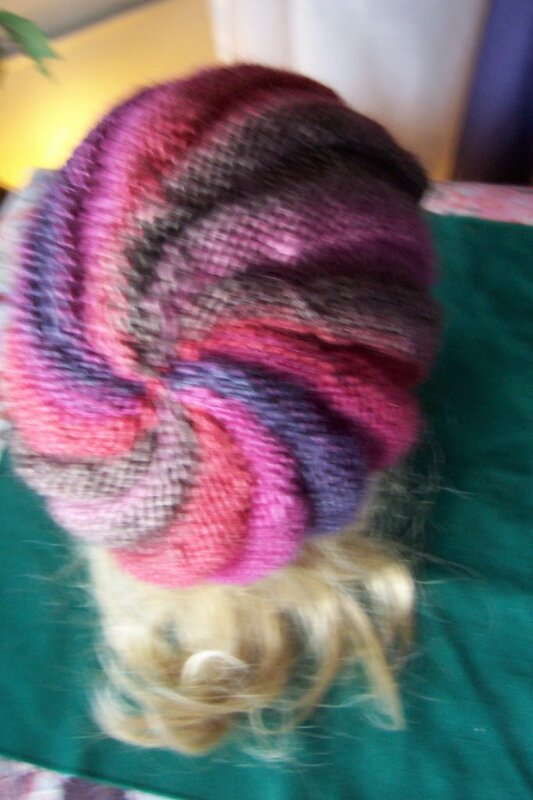 .....2--There was a knot in the yarn, and the stripe pattern was ‘broken’. .......first 3 inches of the knitting is not good. .....3--And finally, last night , knitting, talking and eating chocolate chip cookies with walnuts (a special treat made just on Tuesday nights for the LICKnits Snb group) at Communitea Café , I managed to mess up the lace pattern. 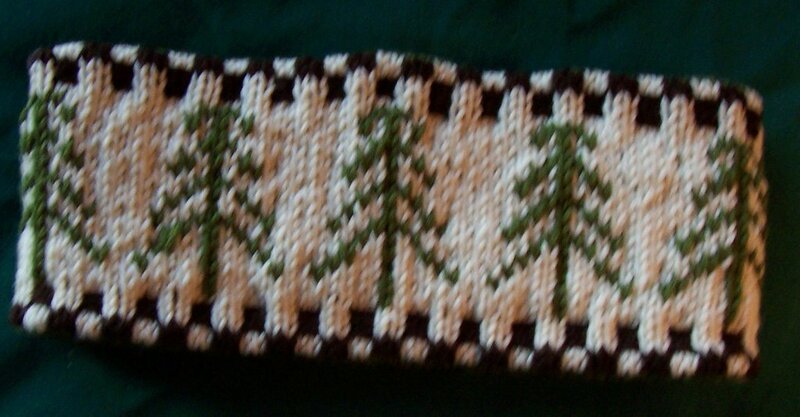 I like the pattern (a fern lace)--even more than the yarn.. 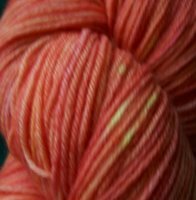 So for now, these socks are going to be frogged.. And new stocks started --with some pale blue Koigu--a yarn that will better show the lace. And this striped yarn will have to wait its turn. Almost 2 weeks to the hour, I finished my gumdrop socks. I experimented with the heel shaping, and while its not perfect, it does hold possibilities. 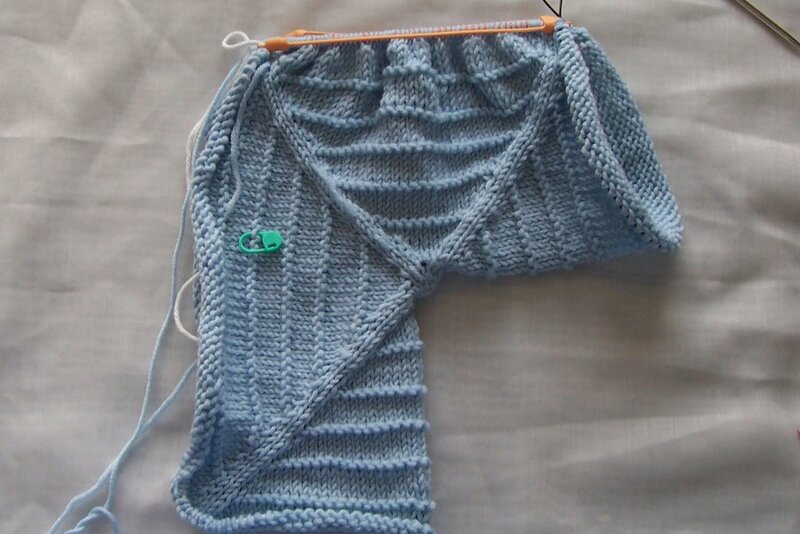 To begin: the gusset is simple reversed. 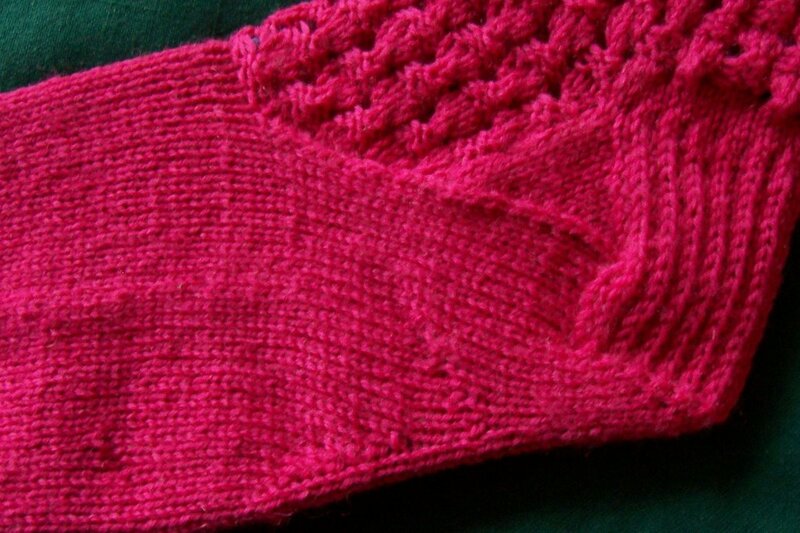 After turning the heel, I counted out 30 stitches (½ of the total) and placed markers. I worked the gusset in reverse, sloping it towards the instep. 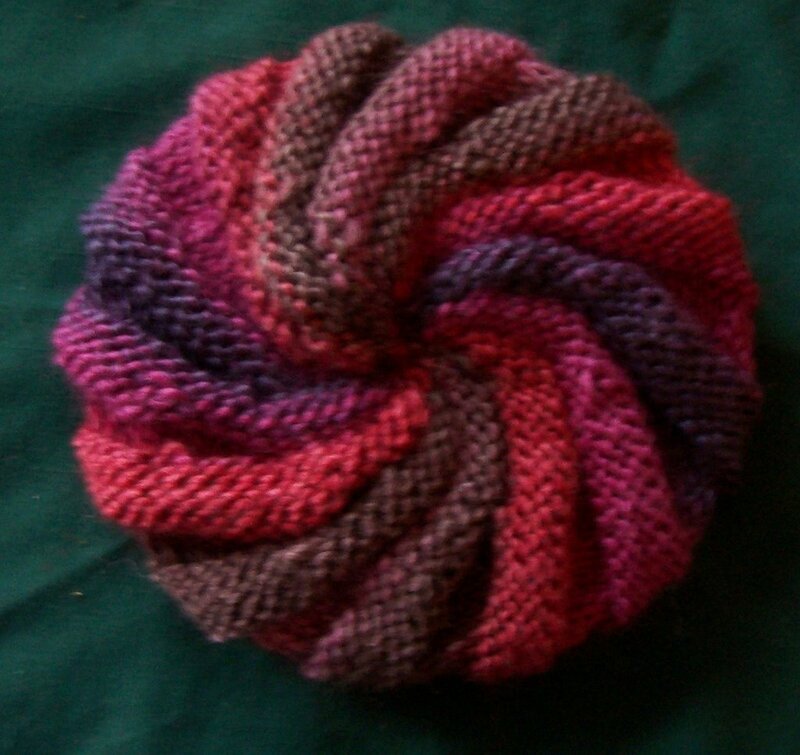 INCREASES tend to make your knitting curve outward or upward. 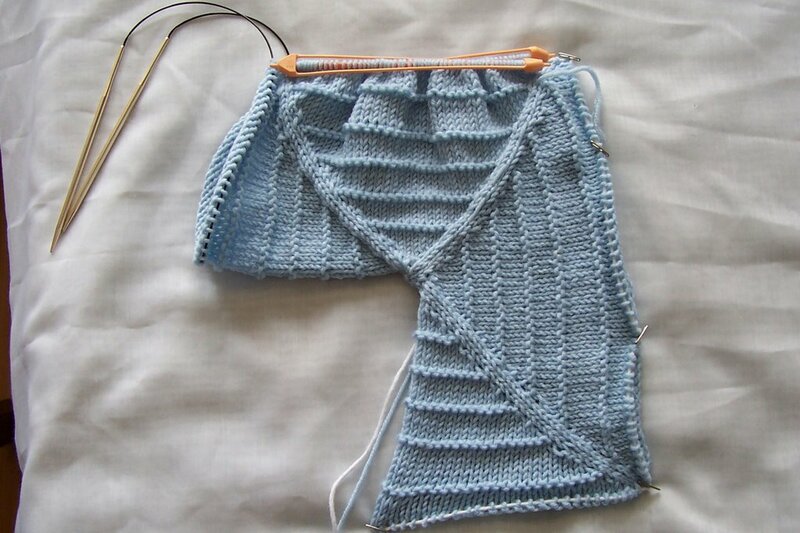 And decreases do the opposite, curving the stitches downward or inward. Well the pattern of increases at sole and decreases at instep resulted in the lower part of the sock looking longer on the needles, but fitting perfectly on the foot. Some thing like the blue line. Well, actually not perfectly, but much better than a normally shaped gusset does. A second feature of this shaping is; eventually you stop. And for some rows after, there is a bit of bulge. This could be a defect, but since I have duck feet, (narrow heel, very wide at ball of foot) the bulge created a bit of ease just where it was needed! The sock fits tight on instep and arch, and then it fits tight on the ball of the foot, too! The toe is a square toe.. (an inverted French/flat toe) it seemed like the thing to do, to have an inverted toe with an inverted gusset. I am going to continue to experiment with inverted gussets and shaped soles and insteps. Not in my very next pair, but soon. Two experimental hats didn’t work, and were frogged back to nothingness. There are other idea’s for more hats that are still fermenting. And some prototypes are being reknit, with minor refinements. Just as with socks, I am always experimenting. But I rarely knit kid socks, and rarer still do I knit plain socks. Even my plainest socks usually have some interesting detail at the cuff, the heel or the toe. I almost never knit a duplicate pair of socks, and finally I often take notes, and document my designs. I love the look of hand dyed yarns in the skein, but I tend to dislike how they knit up. I seen lovely hanks of Koigu, and Lorna Laces, and other yarns. 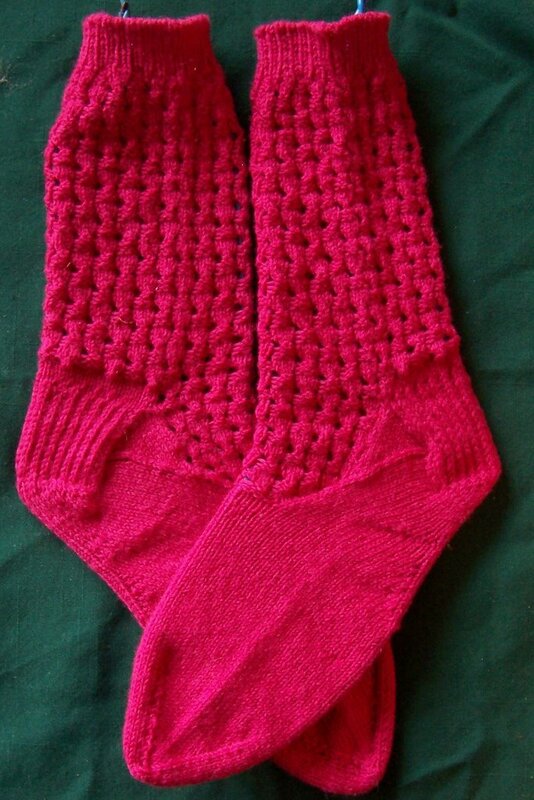 But I’ve never seen a pair of socks knit with these yarns that I really admire, let alone coveted. I tend to gravitate to solid color sock yarn, or self striping yarn. And with solid yarn, I like interesting stitch patterns -- and I am always trying out new heels, or toes, or cast ons. My latest sock were inspired by images of socks in the Fall Vogue Knitting. 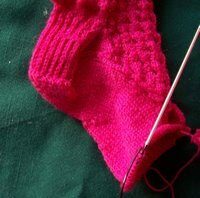 I liked reading about the shaped (arched) sole that Meg Swanson knit, based on one of her mother’s (EZ) designs, and the Cat Borhdi socks with the interesting gusset shaping. 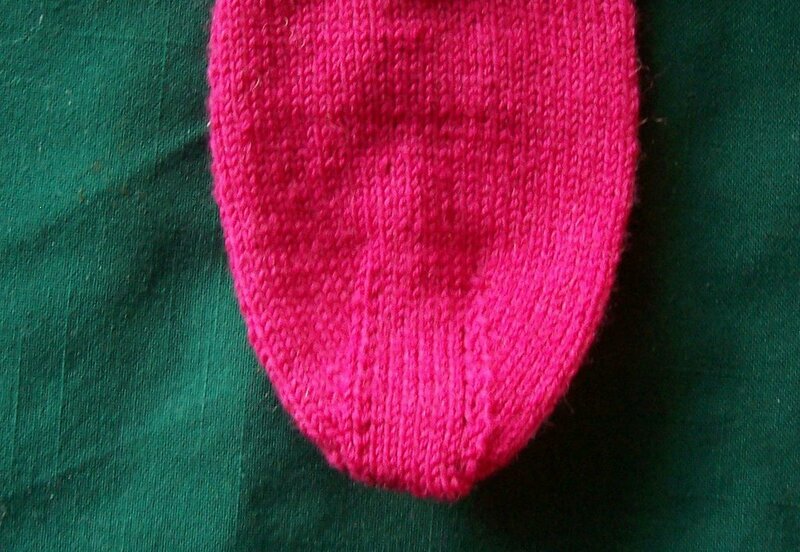 The gusset is inverted, and the gusset decreases continue into the instep (similar to the sock Cat Bordhi designed). In addition, there are increases on the bottom of the sole. (just as in multi color socks designed by Meg Swanson), that shape the underside of the socks. My design, while not quite perfect, uses both of these innovations. I know I am going to continue experimenting with designs that use both these features, working to make them easier to knit, and more attractive. I definitely like the way these changes improve the fit. And it knocked me total out--my computer was a dead as a door nail. Still, it was simple enough to resolve--I guessed, rightly, it was just a bad power supply. Once the PC was apart, I also installed my fire wire card--that’s been sitting on my computer desk since late August waiting to be installed. I got a used digital Sony camcorder in late July, and my thoughts were, if I had a firewire, I could make small digital video clips on techniques. Why not? I have the technical skills, a tripod and camera--what more do I need? (Some indirect lighting? I am a wiz at lighting!) --Oh, yeah, I need memory. I do still need to beef up my memory--but Circuit City is across the street, and black Friday is rapidly approaching.. I don’t get to sleep in on black Friday. As mentioned, Circuit City (Sears, Marshall's, etc) is in the mall across the street, and last year, the traffic jams at 6:00 had police cars (and siren) managing (or perhaps mismanaging) the traffic. This year, I’ll get up early and be first in line for what every brand of memory chip they are giving away as a door buster. Then I just have to do it! Anne Modisett is good inspiration, she’s been peppering her blog with You Tube clips for the past few weeks. I’m not (as I am sure you have noticed!) the world best photographer but with time, and repeated do overs, I suspect I can get something together. I have done training manuals, using power point, with video and text.. But usually, even if I storyboarded what was to be done, someone else was behind the camera. And someone else did all the tedious editing. I took a picture of the old power supply, but with so much to catch up, a photo will have to wait. Except… I don’t--well I do most times, but sometimes… I waffle. It’s a great stitch pattern for knitting swatch-less socks. These socks-- Austermann’s sock yarn with Jojoba and Aloe Vera in the yarn--are knit at 9 stitch to the inch gauge, on size 2(US) but even if they were knitter looser or tighter, they would still be a one size fits most sock. The Villiage Knitter in Babylon, LI. I finished this pair Tuesday, and now have started on a new pair of socks, for me, that I am calling, for now at least, “it’s raining cherry gumdrops” . 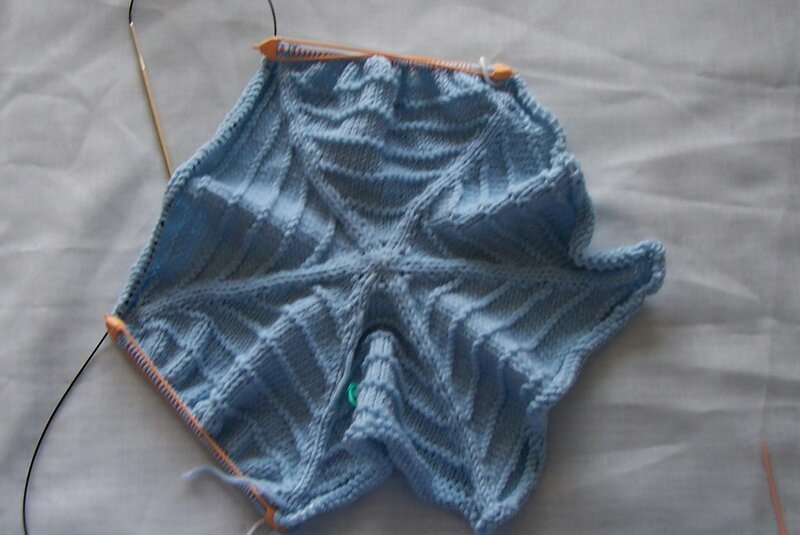 I am also watching The Yarn Harlot’s progress with Lisa Grossman’s pattern “Kitri” (for vanCalcar yarns). 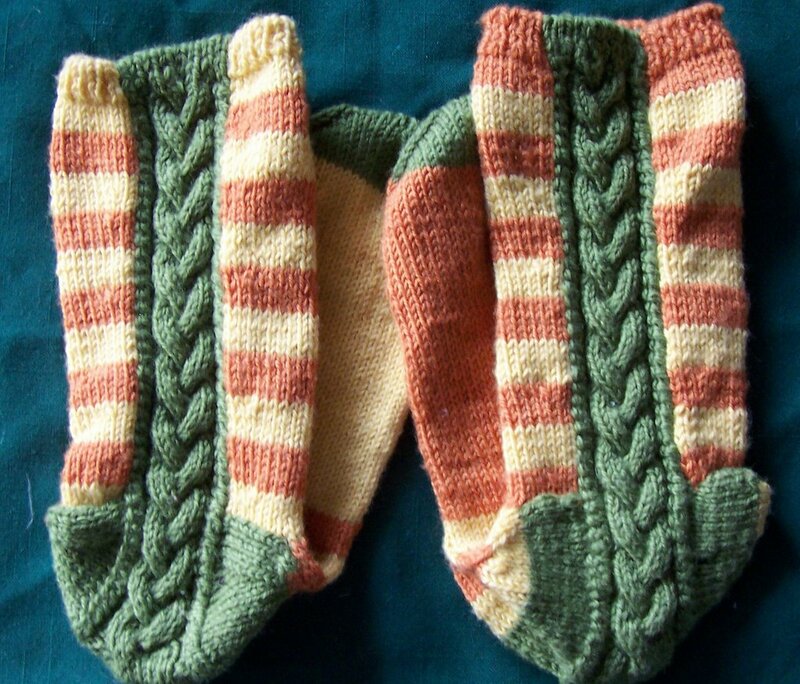 Lisa is another Babylon knitter--and her sock designs are amazing! 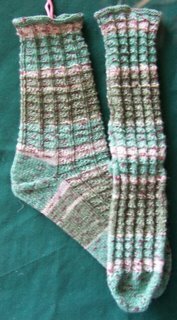 I’ll be teaching socks again in the new year, and would love to teach a class on my obsession, Cast On’s. 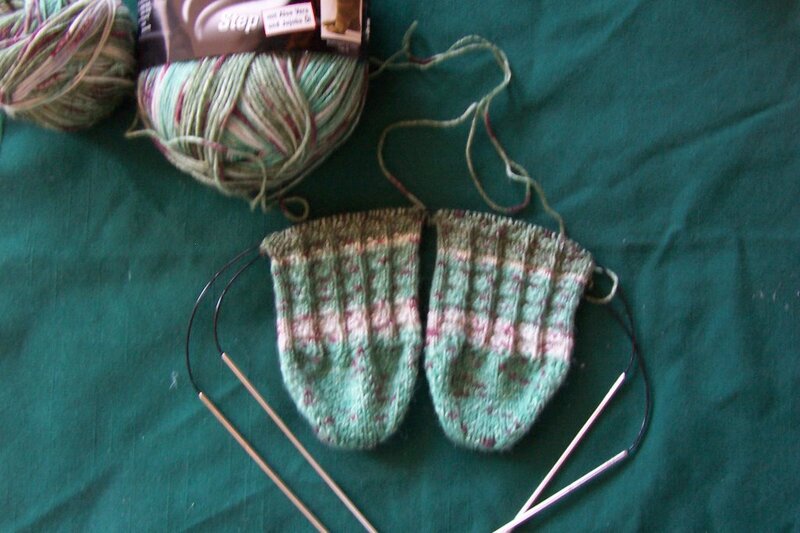 If you’re interested, in a sock class or in a class to learn Cast On’s let Karen know. 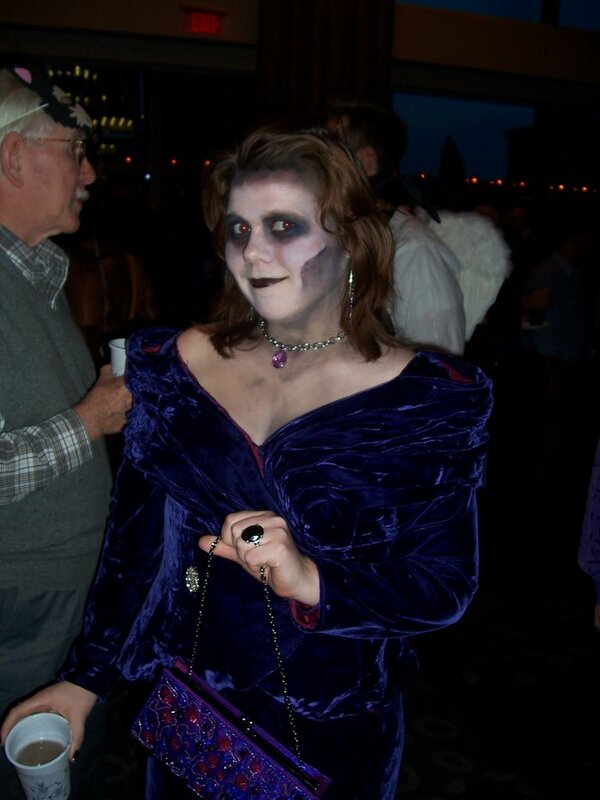 Some day, I might be too old for Halloween. 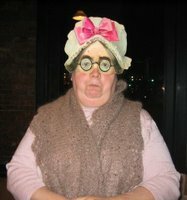 But not yet, even, if I do dress up as Old Knitty Biddy. My son warned me that their camera was broken, so I might not get Halloween pictures of the grandchildren right away but my DD, the Victorian Ghoul looks delightfully dead in this shot. This made the pecan wood bookcase she inherited from her grandparents superfluous. So it moved in with me. The first thing I did to the bookcase was add light (I am somewhat of a fanatic about lighting.) First some low voltage halogens on top-these add a nice white light in what was a previously a dark corner of my living room. Then a set of hockey pucks lights behind the slightly arabesque front molding. These, too, are low voltage halogens. On the lowest open shelf, some almost flat stick up LED’ biscuits lights. These are less than ¼ inch thick! The middle shelves are actually being used as book shelves, instead of display space, and don’t have any added lighting. There is enough generak light available from the low voltage up lights and hockey puck lights on the top shelf to make it easy to read the titles. Right now, its holding an mélange, rather than a collection.. But I have at long last been able to unpack the last of my books! Why didn’t any tell me this? Eons ago, I discovered Elam’s Steel Cut Oatmeal. If this brand still exist, it no longer has a wide distribution in NYC. But there are other brands. At some point, I switched over to McCann’s Irish Oatmeal which comes in lovely tins. But you pay a premium for those tins and for imported oatmeal. Over the years, I have recycled the tins. But still, I want oatmeal, not tins. Recently my local stores have provided me with Bob’s Red Mill steel cut oats and Quaker steel cut oats (this is a new product for Quaker Oats) --while both are a finer cut than the McCann’s or the Elam’s, they are both quite tasty. A disadvantage to steel cut oatmeal for breakfast is cooking time. McCann’s suggests 30 minutes (with frequent stirring) or cooking longer (almost 1 hour!) over a double boiler (no stirring required). That’s a lot of time for a breakfast food. Bob’s Red Mill and the Quaker oats (cut a bit finer,) cook a bit quicker-- and ONLY require 20 to 25 minutes. Again, 20 to 25 minutes of standing by and stirring.-allow extra time if you want to use a double boiler method and skip the stirring. Then I learned you can cheat! Measure out the oat and water into the pot the night before. Cover and let soak. In the morning, you can cook the oats, with minimal stirring, over very low heat for 10 to 15 minutes. It’s still a longer cooking time than rolled oat mush-but not much longer and there is very little effort involved. If you haven’t ever tried steel cut (vs. rolled) oat, do. Think about trying any of these brands, (or what ever brands of steel cut oats you can find locally) and using the over night soak and quick cooking method. You might’ve thought that a duo of computer problems (a nasty virus and intermittent modem) would have freed up time for knitting. You might’ve I would have had my most productive month ever. Well you’d have wrong!-- Oops, make that I am wrong, wrong, wrong! I was reminded, as I began to take and save pictures of the things I remembered knitting, that there were many things I totally forget about! --And realized I sent a pair of tube socks off to my grandson with no photo record. Now they were just plain baby blue tubes socks, in a 1 X 1 ribbing -worked on size 1 needles.. But.. Well, one of the reasons I started my albums on photo bucket was to avoid just this--knitting, gifting the knitting and totally forgetting about what I have knit! So what did I knit in the month of Soctober? With the baby tube socks, this makes 4 pair of socks in the month of Soctober. These sock are samples for the class I'll be teaching at The Village Knitter--more on that in my next post. Early this summer, Pianogirl, (Knitters Review), had a stash buster, and shared (gave away!) lovely yarns to anyone who was interested. I didn’t take all of the cream (I passed on Kid silk mohair!) but I greedily pick out lovely sock yarns. 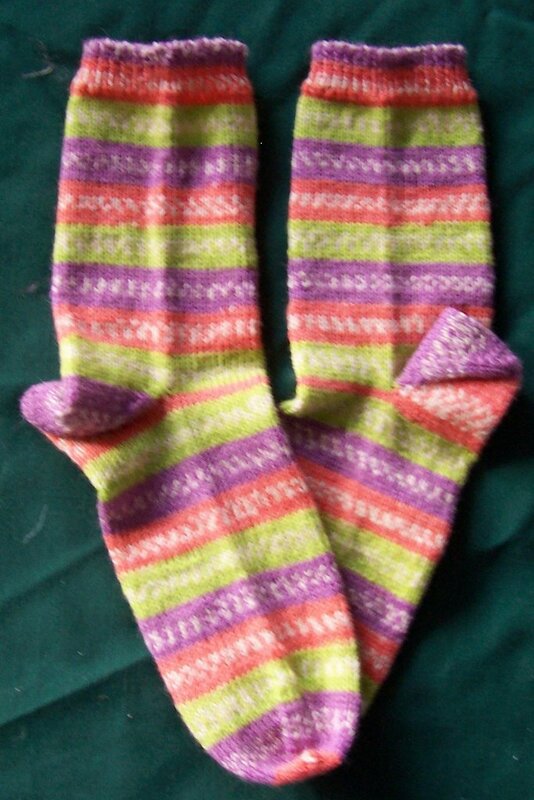 To feel less guilty about plundering her stash, I gave her a pair of hand knit socks--the Kroy Chroma socks. What I got in return was: 2 matching skeins of Koigu,(still waiting to be knit up) a single skein of ArtYarns superwash Merino in sockweight, and Louis Sales Gem Opal yarns. As well as some skeins of Classic Elite’s “Beatrice” (this will turn into something for my granddaughter Beatrice) and other wonderful skeins. Pianogirl collected a lot of single balls/skeins and single skeins, and several of the skeins were the same yarn in different colors. This presented a challenge. I didn’t think a single skein of the Open was quite enough for pair of socks, but 3 different colors are too much. The result was these fun and funky socks. They have been called Muchkin socks, and Umpa Lumpa socks, and other various names.. They are not everyday socks for sure! The Stripes are intentional offset; one sock starts with orange, the other with yellow, and foot of the sock is matched to the starting stripe. The top (cuff/leg) were knit flat, with the green braided cable as intarsia stripe on the edge. 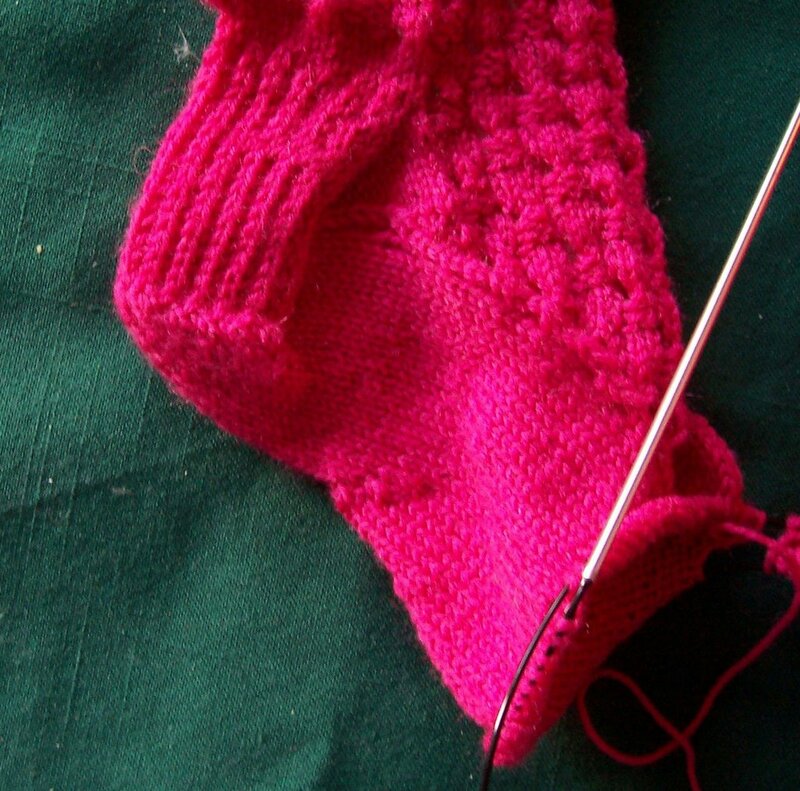 When the leg was completed, the sock was joined into a round for heel flap and turning. The same fern green of the cable was used to make the heels and toes. The cable ended at the turning, and change of gauge (from cable to stocking) gave the turning a bit of extra ease. This little jewel box is made from Lamb’s Pride super wool, (worsted weight) and Juwel (a DK weight yarn)-a sports weight super wash. 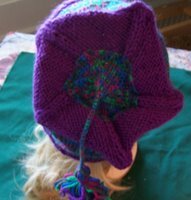 The Juwel was worked twinned knitting style, (I don’t much like it when colors pool) The crown is has a star like 5 point decrease pattern. The tails of yarn make the double chain stitch for the tassel. Last and far from least, a silk (Habu silk!) garter belt in a double ruffle pattern for wedding shower I am attending tomorrow! And that’s it! A month of knitting --and a good reminder to myself to photo record my work--even if I can’t get it uploaded! Its not a huge amount of knitting--but it is almost twice as much as I first thought! What's more, I did a presentation at my guild meeting, went to Rhinebeck (Saturday), bought some tools and equipement, (WPI tool, a Winder, and an I-cord machine) --more on all these in my next post!